Take into account all relevant routes of exposure – inhalation, skin absorption and ingestion – when developing control measures. Choose the most effective and reliable control options which minimise the escape and spread of substances hazardous to health. This includes using appropriate methods of movement and storage. Where adequate control of exposure cannot be achieved by other means, provide, in combination with other control measures, suitable personal protective equipment. Check and review regularly all elements of control measures for their continuing effectiveness. Inform and train all employees on the hazards and risks from the substances they work with and the use of control measures developed to minimise the risks. Anyone responsible for using or handling hazardous substances at work should be well aware of the precautions they need to take. 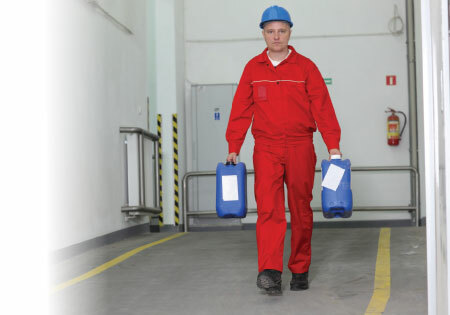 The storage of hazardous substances and materials must conform to guidelines covered by the Control of Substances Hazardous to Health Regulations (COSHH) and The Dangerous Substances and Explosive Atmospheres Regulations (DSEAR) which require employers to control the risks to safety that could occur from fire and explosions. Both sets of guidelines cover a huge range of flammable liquids, chemicals and acids. However certain substances such as lead, asbestos and radio­active materials have their own separate regulations. Even when hazardous materials are out of sight and not in use, they should never be out of mind. Risks could include fire or explosion, and could even have potentially fatal consequences. However most substances won’t cause problems as long as they are stored properly in accordance with the manufacturers’ guidelines. Many hazardous substances are supplied with a safety data sheet which contains information about the safe storage of the product or else it may be worth asking the supplier for their advice. Key considerations include how you will label and maintain details about stored substances, the segregation of incompatible substances, volume limits and whether additional fire or explosion protection is required. Other concerns may include storage conditions such as temperature or light variations, the location of the product and how it will be safely loaded, unloaded and transported, hazards and risks from the substances they work with and the use of control measures developed to minimise the risks. Two new European Regulations are already having an impact on the way chemicals are supplied, packaged and labelled. Adopts in the EU the Globally Harmonised System (GHS) on the classification and labelling of chemicals, so will be adhered to throughout the world. Is being phased in through a transitional period which runs until 1 June 2015 . The CLP Regulation applies to substances from 1 December 2010, and to mixtures (preparations) from 1 June 2015. However there is an extra transitional period for mixtures already labelled and packaged and therefore can be supplied until 1 June 2017. Will replace the Chemicals (Hazard Information and Packaging for Supply) Regulations 2009 – CHIP – from 1 June 2015. One of the main new systems set up by REACH is called ‘Registration’. Companies who manufacture chemical substances or import them into Europe – either on their own or mixed together to make chemical products have to ‘register’ a dossier of technical information about each substance they manufacture or import above a tonne a year with the ECHA in Helsinki. If you buy your chemical within Europe, or in quantities below a tonne a year, you will not have to take part in the new REACH ‘Registration’ system. Plan for the effects of REACH and CLP. Understand the potential impact of any changes in classification. Ask your supplier for feedback. Check the information on the safety data sheet. Make sure your risk assessment is up to date.